Fig. 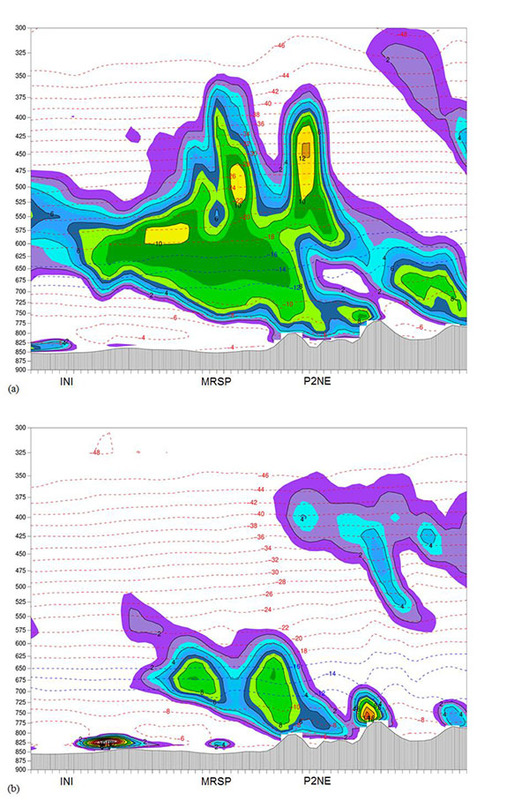 (13) WRF-UEMS Run B3 (WDM6 scheme) cross-section X2 in Fig. (1b) at (a) 1500 UTC and (b) 2100 UTC 26 December 2003 with sum of liquid and ice water mixing ratios (filled colors with solid black contours and black labels: 10-3 g kg-1) and temperature (dashed red contours and labels: ºC); (c) 1500 UTC and (d) 2100 UTC 26 December 2003 with snow mixing ratio (filled colors with solid black contours and black labels: 10-3 g kg-1), temperature (dashed red contours and labels: ºC), and positive vertical velocity (ω < 0: solid purple contours and labels: Pa s-1). The dendritic (−12 to −16 °C) layer is the region of dashed blue isotherms and labels. The horizontal (transect: 220 km) and vertical (pressure: hPa) axes are displayed in the figures.